“C 56” is the catalog number under which the Rembrandt Research Project lists the Self-Portrait, Gemäldegalerie, Berlin, in the Corpus of Rembrandt Paintings [Fig.1]. The absolute authentic paintings of Rembrandt received the “A” numbers; questionable works are listed as “B”, and the “C” numbers mean that the artworks are not painted by Rembrandt at all. Despite “C”, Rembrandt Research Project certifies now, that the C 56 is a “brilliant” painting by the master himself. This paradox not just indicates the controversy surrounding Rembrandt’s oeuvre, but also illustrates the competition of different art historical approaches. The story of C 56 is not just dramatic, it also helps to understand the problems facing the art historical methodology, as well as showing the way art history as a discipline may develop. C 56 is a relatively small panel. Though often underestimated or questioned as authentic, it is one of Rembrandt’s most interesting and unusual self-portraits of 1630s. Arthur Wheelock noted that in 1630s, Rembrandt painted two completely different types of self presentation, “as an accepted member of society; elegantly dressed and honored with gold chains, and as an outsider, whose character, and hence genius, can not be identified with the Dutch middle class.” The Self-Portrait, C 56 includes both characteristics: it shows Rembrandt as the honored member of the society with the “gold chain”, and as an outsider, the cavalier with an extravagant cap and gorget. It is painted in an experimental bravura-rough manner which was a contrast to the middle class taste of the seventeenth century Holland. Therefore it is a programmatic artwork in which young Rembrandt indicates in which direction he will go as an artist developing his style during the life span: pastose paint layers, bravura execution, relief-like modeling with the flat brush; thus, the painting technique which we understand as one of Rembrandt’s hallmarks. According to the curator of Gemäldegalerie Berlin, Jan Kelch, this self-portrait has relatively good provenance. The first known owner of this artwork was probably Comte de Wassenaar d’Obdam. This assumption is based on the sale’s document describing this picture “The Hague, 19 August 1750, No.2: ‘Rembrandt: Portrait van hem zelve, met een gouden Ketting om ’h. 21d., b. 18 ½ “ The measurement in Rhenish feet is equivalent to 56 x 47cm, which is the size of the Rembrandt’s Self-Portrait, “C 56”. Later, in the eighteenth century, this artwork was acquired by Brower for Avet for 202 guilders. The original eighteenth century sale’s label with the “Nr.19” is still attached on the back of the panel. However, there is no documentation how and when this picture was acquired by the Prussian royal family. In 1830, it was transferred from the Royal collection in Potsdam to the Royal Art Gallery in Berlin, which was founded in the same year. Since then, this painting belongs to the Prussian State Art Collections. It was exhibited in Kaiser Friedrich Museum until WW II; after the war it was moved from the bomb shelter to the Dahlem Museum in West Berlin. In 1998, the Prussian State painting collections were relocated to the new-built Gemäldegalerie at the Kulturforum, Berlin. In 1916, George Simmel provided his philosophical criteria of Rembrandt’s portrait-art as a representation of life experience with all its contradictions. Rembrandt’s “Gestalten” show the life-process itself by rendering Individuality in its non-comparative meaning. Therefore, Rembrandt’s portrait-art unites the subjectivity of artist’s personality with the Absolute of Life. This results in the experience of “Totaleexistenz”, when the dualism of body and soul disappears, resolving inner psychological conflicts. Rüdiger Klessmann pointed out that C 56, was painted in the first years of Rembrandt’s success in Amsterdam; therefore it exposes and exhibits the self-confidence of a young artist, “confronting us with a scrutinizing glaze.” The symmetrical composition reflects the feeling of calm and stability. Overall, the warm, ocher hues dominate the painting surface. Horst Gerson regards this artwork as “charming” and points out that its “rough” and “vigorous technique” can be traced to the self-portraits created in 1629 in Leiden. Gerson also suggests that this self-portrait is a pendant to the Portrait of Saskia.van Uylenburgh. This proposal is based on the biographical and stylistic arguments. Saskia’s portrait of 1633 is her first portrait as Rembrandt’s bride: they married in June 1634. Saskia belonged to the rich and respected Friesian family. With this marriage, Rembrandt, the son of a provincial miller, was elevated into the upper class of the society. Gerson’s proposal, that after the marriage, Saskia’s portrait needed a pendant representing her husband, appears logical. Both pictures have similar size; both figures have similar pose, both have similar wide soft caps with the feather. Originally, Rembrandt’s Self-Portrait was painted without a cap. It was added later, which can be seen as an additional argument that this self-portrait was adjusted to fit to the Saskia portrait. However, there are no contemporary evidences or documents which would confirm the theory that these two pictures belong together. In the middle of 1980s, C 56 was x-rayed. One of the leading experts of the Rembrandt Research Project - RRP, Ernst van de Wetering, was invited to investigate the results. The x-ray has clearly shown that the painting has some similarities to another self-portrait in the Louvre, Paris which was painted in 1633. The x-ray also shows that the soft cap with a feather and gorget were added later. This finding motivated the curator of the European Paintings of the Prussian Collections in Berlin, Jan Kelch, to suggest that this artwork is a copy of the Louvre self-portrait. The attribution was given to Govert Flinck, who by entering Rembrandt’s studio in 1633 was nineteen years old. He stayed in Rembrandt’s studio for one year. 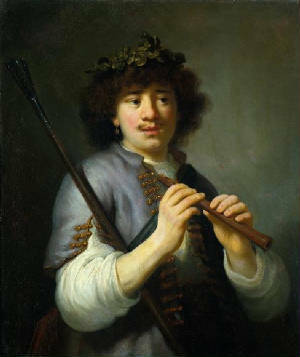 Prior to the training by Rembrandt, Flinck received training by Lambert Jacobsz and had three years of apprenticeship. This artwork was presented as “Govert Flinck, Bust of Rembrandt” in the 1991-92 exhibition Rembrandt. The Master and his Workshop, which was shown in Amsterdam, Berlin and London. In the “Director’s Foreword” to the catalog of this exhibition it was mentioned that the main goals of this show are to demonstrate a “new Rembrandt”, discovered in the last twenty years of research as well as to “show to public how decisions about attribution are made.” Flinck’s paintings of 1636 and several rarely seen Rembrandt paintings from private collections were also exhibited. This possibility of the direct observation of the original paintings gave ample opportunity to ‘rediscover Rembrandt’. The curator of the European painting of the Metropolitan Museum of Arts, Walter Liedtke, describes the effect of this exhibition, “The conjunctive that the panel was painted by Flinck around 1633…was conveniently disproved by the two Flinck tronies of 1636 in the exhibition.” He also points that the similarities of C 56 with the rarely seen Rotchild’s Standard-Bearer, which is another Rembrandt self- portrait of 1630s, is so strong, that there can be no doubt that C 56 was painted by Rembrandt. He also points that “the reassignment of Rembrandt’s Self-Portrait in Berlin (C 56, Slatkes no. 248) and of his Self-Portrait in Pasadena (C 97; Slatkes no. 255) to two teenagers Flinck and Fabritious, respectively, the RRP has hitched its wagon load of hypothesis to horses we know something about.” Several leading art-historians shared this opinion. Unexpectedly to organizers, the exhibition brought Rembrandt Research Project and the Gemäldergalerie Berlin into troubles to question their credibility. During the XXVIII International Congress of History of Art in Berlin, 1992, one of the leaders of RRP, van de Wetering questioned the theory that Rembrandt and his students never collaborated on the same paintings. In 1960s – 1980s, this theory, the guideline for the RRP for almost twenty years, resulted in re-attribution of many artworks. Thus, for the first time, the credibility of the RRP attribution praxis was questioned by one of its leading members. During the same session, Claus Grimm presented the results of his research and the evidence that the students indeed contributed to the Rembrandt’s paintings, cooperating with their master. Grimm suggested keeping attribution to Rembrandt in such cases. In his book, published in 1991, Grimm also argues that the Self-Portrait, C 56, is surely painted by Rembrandt’s hand. He points, that the face “mit einem pastigen Pinselstrich in grosser Formsicherheit gemalt [the pastose brushstrokes confidently model the shape]; “Der freundlich-kritische Blick...mit wenigen Pinselzügen eingefangen.” [the effect of friendly-scrutinizing eyes …is achieved with a few brushstrokes.] This picture is painted with “solche Ausdrucksicherheit und Formklarheit, dass jede Schülerhand ausscheidet.” [such confidence in achieving the maximum of expression and form that the execution by any student-hand is out of question.] The big format high quality photographs allow the readers of this book to follow Grimm’s argumentation. After the XXVIII International Congress, the Gemäldegalerie Berlin changed the attribution of this self-portrait classifying it as “Rembrandt, Circle. The Bust of Rembrandt.” In traditional art historical designation praxis, “circle” means that the artwork was eventually created by an unknown Rembrandt follower outside of the workshop. Such designation in regards of this painting appears questionable because, despite all the controversies, it was a consensus that C 56 was created in Rembrandt’s studio. In 2005, the Rembrandt Research Project also corrected Govert Flinck attribution ‘returning’ this artwork to Rembrandt. In “Corrigenda” of the volume IV of Corpus, the RRP lists this self-portrait as “C 56/ Br.23. Rembrandt and Studio. Self-Portrait overpainted in a tronie. c.1633 partly overpainted 1637. Formerly, Bust of Rembrandt, Berlin.” The argument, that the over-painting took place in the particular year, 1637 is not based on any new scientific evidence or documentation; but represents the new theory that Rembrandt over-painted several self-portraits in late 1630s- early 1640s. The Standard-Bearer, 1636, which also was exhibited in 1991, and C 56 show some similarities in the way how face and attributes are painted. Therefore, it is possible to suggest that C 56 over-painting can be seen as a preparation for larger and more elaborate The Standard-Bearer, and therefore created before 1636. However, RRP certifies that the “first state” of 1633 is Rembrandt’s “brilliant broadly painted self-portrait.” Regarding the second state: the additions of cap, gorget, and the shadow in the face, whether “was effected by Rembrandt himself or by a member of the workshop is not entirely clear in this case.” This basically means that the later over-painting is done with such confidence that the Rembrandt experts of RRP are not able to re-attribute it to Rembrandt’s students. It raises the next question, why “Rembrandt and Studio” in the first place? The RRP decided to dissolve itself in 2011; therefore many questions will probably remain unanswered. RRP also insists that the second version, the added attributes- the cap and gorget have the function to transform the self-portrait in a “tronie of a German landsknecht.” In Rembrandt’s time, the landsknechts did not exist anymore. Their organizations were abolished by 1570s. In 1572, the Dutch military leader of the revolt against Spain, Prince William of Orange, issued articles of war which started the transformation of landsknechts into soldiers. Maurice of Nassau completed the transformation in 1590, thus creating the regular army of the Dutch Republic. The dashing wide landsknecht caps with colorful feathers disappeared already in 1560s, giving the way to cabacete and cabasset helmets instead. 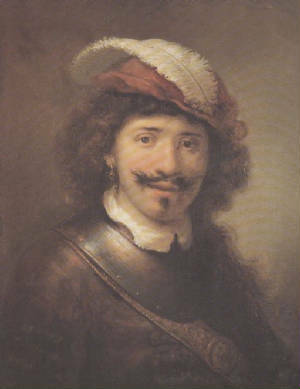 In 1630s, when Rembrandt created his self-portrait, C 56, the majority of people were already not able to associate the wide cap with the landsknechts. The soldiers and mercenaries were associated with the helmets. The RRP’s “German landsknecht” suggestion is probably based on the flat wide cap and the gorget. However, the “landsknecht” in The Standard-Bearer, is identified by the old fashioned hat-trim and especially by the sixteenth century attributes: dress and sword. The gorget looks like those used in Rembrandt-times. Perry Chapman explains, that “To contemporary Dutchmen this costume signified not merely soldiers, but the ancient Batavians.” The attributes in C 56 do not indicate such ancient figure; therefore, there are no convincing reasons to suggest the “German landsknecht”. The particular Rembrandt’s cap in C 56 has an extremely wide trim, resembling the trim of the cavalier hats. While the cavalier hats were very popular by the respectable gentlemen, Rembrandt’s headwear represented an extravaganza outside of the mainstream, demonstrating his boldness. 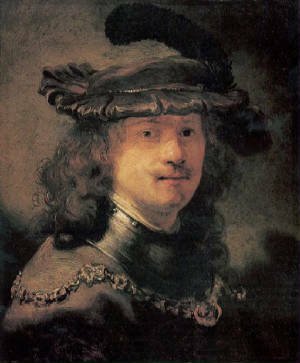 Such male portraits, including self-portraits, with feathered ‘extravagant’ cap and gorget can be often found in works of Rembrandt and the artists of his circle. Stephanie Dickey noted that despite a “military flavor” they represent a “cavalier type”. In the Seventeenth Century, the gorget, as an attribute was largely used in portraits of nobles and royals. The gorgets were normally not carried by common soldiers: it was often the part of the officer’s uniform. In Rembrandt’s Night Watch, the gorget is the only part of the officer’s costume indicating his elevated position [Fig.4]. Therefore, gorget indicated high ranking military status and nobility or eventually noble spirit like in “cavalier type” pictures. The gold chain was a recognizable indication of the high social status and financial prosperity. In 1634, Rembrandt wrote in one private guestbook his motto, “Een vroom gemoet acht eer voor goet.” [a brave temper prefers honor over possessions.] The attributes in C 56 metaphorically represent all three elements of this motto. The cap stands for boldness, the gorget for honor and the chain means financial prosperity. This self-portrait was painted in the time, when Rembrandt, a young provincial artist, was suddenly raised into the top echelon of the society. All the ways and possibilities opened up to him: he had to decide, which way to go. Therefore, it is convincing to suggest that the attributes were painted in the first half of 1630s. The corrections and re-evaluation of research results is a normal part of the scientific process, despite this, the case of C 56 is extreme. Gary Schwartz suggests that we should investigate for the learning purpose, how “detailed, highly negative judgment from 1986 relates to the lyrical one of 2005.” He concludes that “not only the credibility of the Corpus but of connoisseurship itself is at stake here.” Cathrine Scallen points out, that RRP starting with the intentions to provide more objective opinions then the older generation of Rembrandt connoisseurs, did not escape their own bias and subjectivity, and despite “sometimes prolix verbiage”, their “argumentation has proven no more inherently convincing…” However, the connoisseurship method developed by Ernst van de Wetering immensely contributed to the understanding of Rembrandt’s style, but produced several errors in the attribution to the concrete painters working in Rembrandt’s studio. Wetering is specialized in the genesis of Rembrandt artworks: how they are built from the primer surface, what materials where used, what devises where implemented in achieving form and expression. He also investigates how Rembrandt’s technique developed and changed during the years. Wetering also integrates the results of the chemical and physical tests on the paintings. This method can successfully identify works created in Rembrandt’s studio, but can barely differentiate the individual ‘signature’ brushstrokes of the individual artists using these techniques. Therefore, at the end, his analysis of the authenticity is based on the ‘traditional’ connoisseur’s opinion. The connoisseurship method demonstrated by Claus Grimm proved to be more successful in individual identification. His method is based not on the traditional ‘overall impression’, but on the concrete brushstroke, how confidently it is used to achieve form and expression and the level of its precision. He was able to differentiate several brushstroke techniques indicating the brushstroke of Rembrandt and the students. In support of Grimm, the art historical research confirms that the painting technique was immensely important in Seventeenth Century art. Presenting the contemporary documents, Anna Tummers convincingly demonstrates that the authentic brushstroke by a master was searched for and valued by Seventeenth Century art-lovers, collectors and dealers. Therefore, several master-painters, including Rembrandt, developed their precise ‘signature’ brushstroke, which made it difficult to imitate their techniques. Rembrandt students, working with him in his workshop, were able to imitate his working methods and overall style, but not his brushstroke manner. Such new research results and discoveries leave plenty of opportunities in the further development of the connoisseurship methods. Figure 4. Rembrandt. The Night Watch. 1642, Oil on Canvas, 363 x 437, Rijksmuseum, Amsterdam. Detail, Lieutenant Willem van Ruytenburch. Chapman, Perry H. Rembrandt’s Self-Portraits. A Study in Seventeenth-Century Identity. Princeton: Princeton University Press, 1990. Dickey, Stephanie S. “103 Man in a Plumed Cap”. Rembrandt/ Not Rembrandt in The Metropolitan Museum of Art: Aspects of Connoisseurship. 2 Vols. New York: The Metropolitan Museum of Art, 1995. Fleisher, Roland, ed. Rembrandt, Rubens, and the Art of their Time: Recent Perspectives. University Park: Pennsylvania State University, 1997. W. Gaetgens, ed. Kunstlerischer Austausch. Acten des XXVIII Internationalen Kongresses fur Kunstgeschichte Berlin, 15-20 July 1992, 627-630. Berlin, 1993.
vols. The Hague, 1753. reprint, Amsterdam, 1980. Workshop. Paintings. New Haven: Yale University Press, 1991. Klessman, Rudiger. Holländische Malerei des 17. Jahrhunderts. 1969, Second Edition, Berlin: Staatliche Museen Preussischer Kulturbesitz, 1983. RRP. A Corpus of Rembrandt Paintings. Heidelberg: Springer Verlag, 5 vols.1982-2011. Scallen, Catherine. Rembrandt, Reputation, and the Practice of Connoisseurship. Schwartz, Gary. Review. Ernst van de Wetering, Self-portraits, Corpus of Rembrandt Paintings. Vol.IV. [HNA and Review of Books. Nov. 2006: 28-31] access: “Schwarzlist documents” http://schwartzlist.wordpress.com/2010/09/23. Countries in the Second Half of the Sixteenth Century” International Review of Social History. [51, 72-92]: 2006. Cambridge: Cambridge University Press, 2006. Tummers, Anna and Koenraad Jonckheer, ed. Art Market and Connoisseurship. Amsterdam: Amsterdam University Press, 2008. Valentiner, Wilhelm. Meulenhoffs Kunstler-Kalender. Amsterdam: Meulenholff, 1907. Wetering, Ernst van de. “The Search for the Master’s Hand: An Anachronism?” Thomas W. Gaetgens, ed. Kunstlerischer Austausch. Acten des XXVIII Internationalen Kongresses fur Kunstgeschichte Berlin, 15-20 July 1992. 627-630. Berlin, 1993. Arthur Wheelock. “Rembrandt Self-Portraits: The Creation of a Myth.” Roland Fleisher, ed. Rembrandt, Rubens, and the Art of their Time: Recent Perspectives. (University Park: Pennsylvania State University, 1997), 15. Jan Kelch. “Attributed to Govert Flinck Bust of Rembrandt (? )” Rembrandt: the Master and his Workshop. Paintings. (New Haven: Yale University Press, 1991), 314. Jan Kelch. “Attributed to Govert Flinck Bust of Rembrandt (? )” 314. Catherine Scallen. Rembrandt, Reputation, and The Practice of Connoisseurship. (Amsterdam: Amsterdam University Press, 2004), 20. Georg Simmel. Rembrandt. Ein kunstphilosophischer Versuch. Reprint of the First Edition, 1916, (Munich: Mathes, 1985), 203. Beat Wyss. “Simmels Rembrandt” , Georg Simmel. Rembrandt. Ein kunstphilosophischer Versuch. 1916, (Reprint of the First Edition, Munich: Mathes, 1985), xxi. Jan Kelch. “Attributed to Govert Flinck Bust of Rembrandt (? )” Rembrandt: the Master and his Workshop. Paintings. (New Haven: Yale University Press, 1991), 316. Walter Liedtke. “Reconstructing Rembrandt and his Circle: More on the Workshop Hypothesis.” Roland Fleisher, ed. Rembrandt, Rubens, and the Art of their Time: Recent Perspectives. (University Park: Pennsylvania State University, 1997), 43. Ernst van de Wetering. “The Search for the Master’s Hand: An Anachronism?” Thomas W. Gaetgens, ed. Kunstlerischer Austausch. Acten des XXVIII Internationalen Kongresses fur Kunstgeschichte Berlin, 15-20 July 1992. (Berlin, 1993), 627-630. Claus Grimm. “Die Frage nach der Eigenhandigkeit und die Praxis der Zuschreibung” Ibid., 631- 648. Claus Grimm. Rembrandt selbst.Eine Neubewertung seiner Portratkunst. (Stuttgart: Belser Verlag, 1991), 100. Stephanie Dickey. “103 Man in a Plumed Cap”. Rembrandt/ Not Rembrandt in The Metropolitan Museum of Art: Aspects of Connoisseurship. Vol.II (New York: The Metropolitan Museum of Art, 1995), 236. Wilhelm Valentiner. Meulenhoffs Kunstler-Kalender. (Amsterdam: Meulenholff, 1907), 57. Gary Schwartz. Review. Ernst van de Wetering, Self-portraits, Corpus of Rembrandt Paintings. Vol.IV. [HNA and Review of Books. Nov. 2006: 28-31] access: “Schwarzlist documents” http://schwartzlist.wordpress.com/2010/09/23. Claus Grimm. Rembrandt selbst.Eine Neubewertung seiner Portratkunst. (Stuttgart: Belser Verlag, 1991).